After purchasing or signing up for a free trial of a hosting plan from HostingVideo.com, you will receive your login credentials and the IP of your instance of subsonic media hosting. If you have a lot of videos and music files that you want to get on your server, the fastest way to upload them is via FTP to your server. This quick tutorial will show you how to connect to your subsonic video hosting via FTP using our favorite free FTP program, Filezilla. After you download and install Filezilla, you will want to setup an FTP connection to your HostingVideo server by going into File->Site Manager and clicking new site. Fill out your FTP connection information. Be sure to include the port and note that your FTP connection credentials are different then your default browser settings. Click connect and you’ll connect to your Video Hosting site. From here you can create and upload your video, music and media files to use with your subsonic video hosting service. For this example, I want to upload a new TV episode to my hosting plan. So I will navigate to the TV folder and then create a new folder for your show or video file so that everything is organized for you in Subsonic. 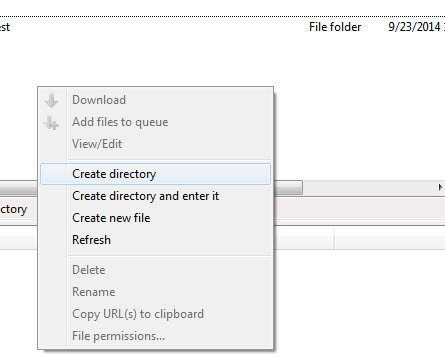 Right click in Filezilla and select, Create Directory to create a new folder for you video file. Double-click and navigate to that folder and then Drag-Drop the file into that folder. You can queue up as many video, music and media files as you want using FTP. You can watch your upload progress to make sure each file successfully uploads. When the upload is complete, your file has been uploaded and is ready to watch in Subsonic on your Hostingvideo.com hosting plan.